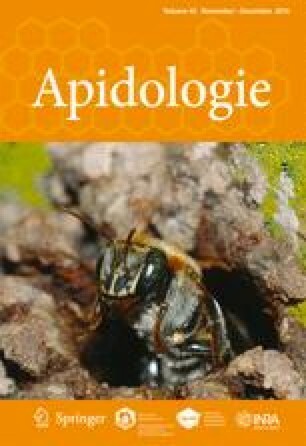 The ability to distinguish feral and managed honeybees (Apis mellifera) has applications in studies of population genetics, parasite transmission, pollination, interspecific interactions, and bee breeding. We evaluated a diagnostic test based on theoretical differences in stable carbon isotope ratios generated by supplemental feeding. We evaluated (1) if carbon isotope ratios can distinguish feral and managed honeybees and (2) the temporal persistence of the signal after discontinuation of supplemental feeding. We compared carbon isotope ratios from four types of experimental colonies: feral, managed with and without supplemental feed, and managed with 13C-labeled glucose added to supplemental feed. There was a significant difference between the isotopic signatures of colonies receiving supplemental feed and unfed feral colonies. This difference, however, only persisted for a few weeks after supplemental feeding was discontinued, suggesting that this method may work best under a narrow range of conditions. This work highlights the potential for exploiting temporal turnover of carbon in bee tissues as a tool for studying nutrient flow in honeybee colonies. We thank B. Nolan, P. Quinn, and N. Weaver for their contributions to the apiary management and B. Tran, E. Lake, and D. Gruenewald for their assistance in pinning bees in the lab. H. Briggs, E. Dobbs, D. Tarpy, and two anonymous reviewers provided constructive comments on the manuscript. B. Ryan and D. Barr both provided helpful discussion on analytic chemistry and the use of a microbalance. We are grateful to the Chattahoochee-Oconee National Forest for permission to collect feral swarms. This work was funded by the US Department of Agriculture (NIFA 2011-67013-30131 to BJB, KSD, and J. De Roode), the US National Institutes of Health (R01-109501-01, part of the joint NIH-NSF-USDA Ecology and Evolution of Infectious Diseases program, to J. De Roode, BJB, and KSD), Emory University (Scholarly Inquiry and Research at Emory grants and the James G. Lester Environmental Studies Research Grant, both to LMA), and the North American Pollinator Protection Campaign (Honey Bee Health Grant to BJB, KSD, and LLM).